As Michele Bachmann continues to attract increasing attention following her performance in last week’s Republican presidential debate, questions will once again be asked about the unique challenges facing female candidates running for political office in the United States. One of these challenges is known as the “double bind”. As with men, if women do not appear to be tough enough to handle the challenges of office, they are likely to suffer in the eyes of the voters. However, women are thought to face an additional challenge: if they appear too tough, then they can be seen as violating gender stereotypes, and thus that could conceivably hurt them in the eyes of voters. Thus women are essentially assumed to be caught between a rock and a hard place here in a way that men are not. The conventional wisdom is that female politicians are greatly constrained by a toughness-related double bind: if a woman fails to demonstrate toughness, she confirms a stereotype that women are not strong enough to lead; yet if she demonstrates toughness, she will be disliked for violating gendered expectations. Although this double-bind is commonly seen as a principal challenge facing women on the campaign trail, political scientists have neglected to evaluate this issue empirically. With a large-N, representative sample of U.S. adults, this study utilizes a survey-based experiment to thoroughly test the conventional wisdom. Contrary to the conventional wisdom, female politicians do not suffer a disproportionate penalty for acting in a tough manner; in fact, this analysis shows that tough women benefit on several key measures relative to tough men. It would be interesting to see if this finding holds up when transferred to audio-visual media, which is likely to be the primary way in which most voters become acquainted with Ms. Bachmann. One could imagine that these kind of gender stereotypes in terms of behavioral expectations would be more easily offended by visual cues than by print media. But either way, the findings certainly cast doubt on the received wisdom concerning the double bind. The full paper can be downloaded here. 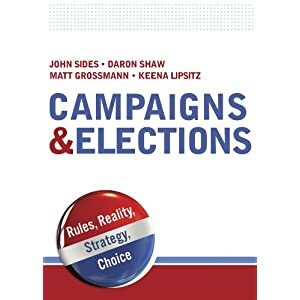 An updated version of the paper, which will appear as a chapter in Brooks’ forthcoming Princeton University Press book He Runs, She Runs: Gender Stereotypes, Double Standards, and Political Campaigns, can be found here.